We’ve had a couple of posts recently using my Henderson’s but they weren’t in the normal confines of my usual recording spots so we’re back to normal in this post with my oldest set of pipes. Feeling a bit nostalgic so we start off with some reels, the first one I learned off an Irish fiddle player on the smallpipes, the second I’ve known forever but had to change versions to match said Irish fiddle player, third is a tune I got out of an Irish fiddle book before I ever knew it was a pipe tune, and fourth is the closer to the band medley (go figure my fingers would fumble on the last tune!). Then we’ve got the band’s new 6/8 march set. I’m still sight reading this one off the page. Last, we’ve got some more Irish stuff because I was in an Irish mood. Finally, a shout out to Murray Huggins of Colin Kyo bagpipes. He is the man. We’ve been playing his chanters in the band for several years now. Everybody loves them. Small holes that are close together with lovely tone. We’re not for volume, not that we’re aiming for quiet, but these chanters get the job done. 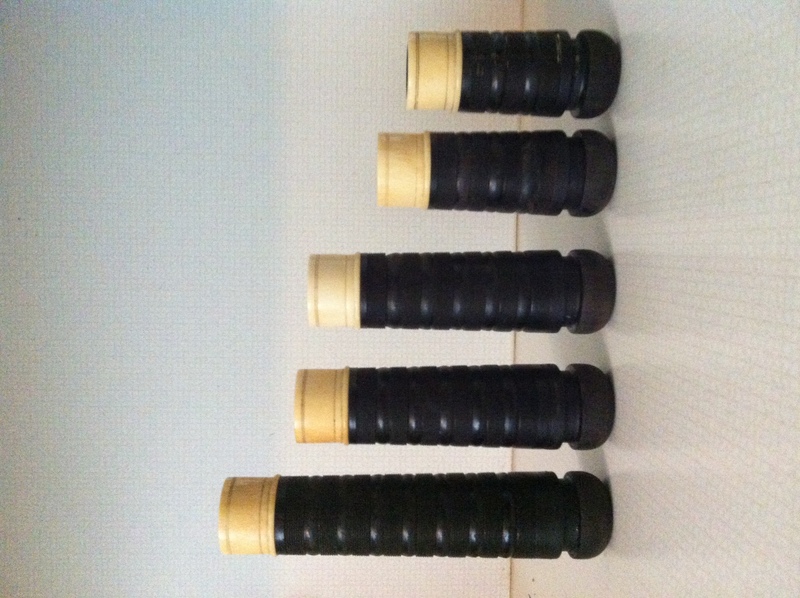 Our philosophy is play a chanter that is comfortable with reeds that are comfortable to blow. Some bands have gone to big band chanters and I’ve noticed as of late I can barely hear their drones. This is localized to Texas, note, but I feel by using just a “regular” chanter we maintain a good chanter/drone volume balance. Our goal is to have fun, not blow our ears or guts out. 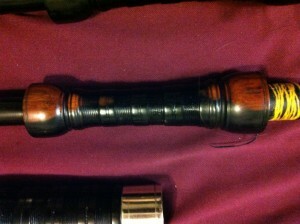 If you’re one who wonders: old L&M bag, Husk chanter reed, Naill spec Rocket drone reeds, Gibson tube trap. Are they really Robertson’s? 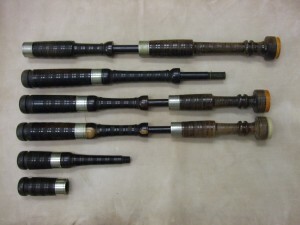 IDing a set of bagpipes. Alrighty, are these really Robertson’s? 1. Bushings are totally off. 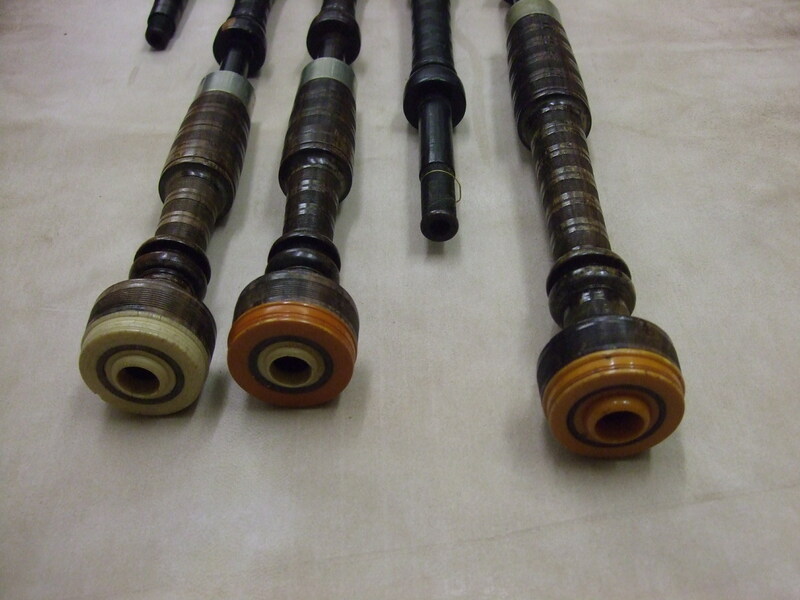 Robertson’s bushing are raised but very short and are flat. These are raised but a little large and they are curved the whole way. 2. Everything is rounded. The bottom of the bells aren’t square and the flare off the shoulders if fairly round. 3. Unique turning styles. Button mount doesn’t match any other button mount Robertson on Island Bagpipe, Jim McGillivray, or Ringo Bowen‘s website and the flat combing is a new one on me (the styling, not the concept). 4. Robertson only used casein and ivory, that I know of. Both stay white. Old casein looks like chalk and ivory looks like ivory. This stuff has turned yellow. It isn’t celluloid (no single line grain), certainly not ivory (no schreger lines), and not casein (because it turned yellow and it isn’t chalky). Jim McGillivray has Robertson using casein into the 1940’s so why doesn’t this set have casein? It looks like the plastic Hardie was famous for. 1. 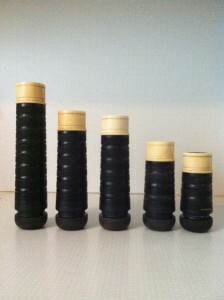 Rounded stock bottoms (chanter stock obviously a replacement). 2. Mismatched tenor stock heights. 3. Double scribe lines on the bass below the shoulder. 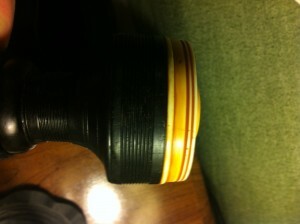 See pic of rounded shoulder above. 4. Bass tunes high on both pins (yes, top pin should always be high). 5. 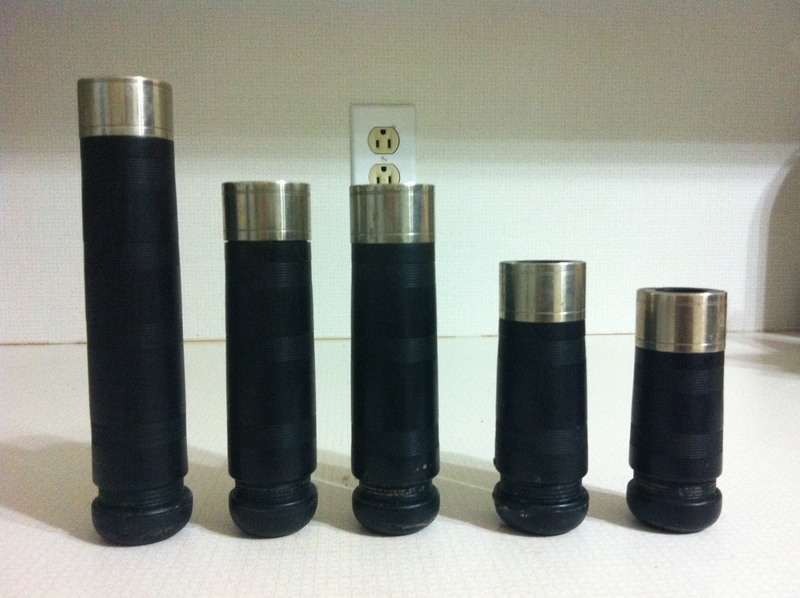 Bore specs are identical to that provided by Dunbar regarding their 1930’s replica save for the bass bottom bore on these which is 0.02″ smaller in diameter. So, they work great with Canning’s! 6. These pictures come from Craig Farley who purchased the sister set to the one featured so far in this post from the same vendor, both claimed to have been purchased in 1947. 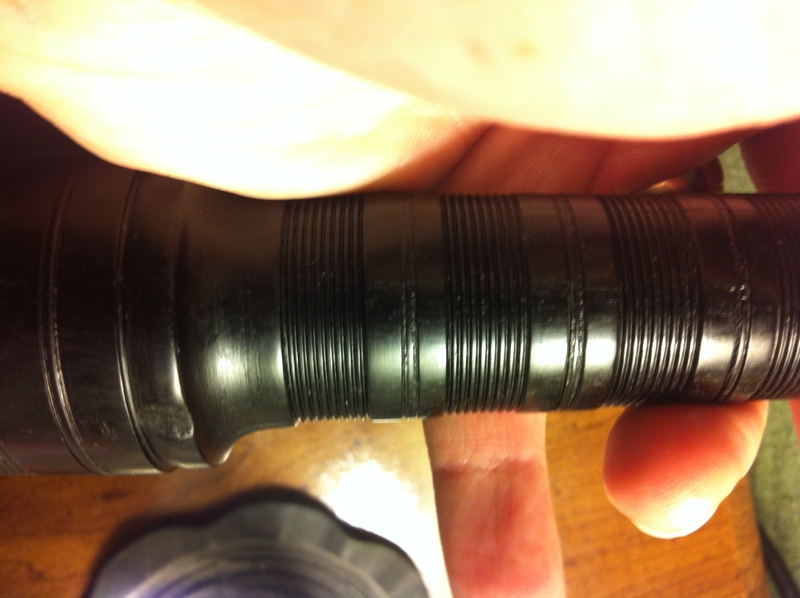 The varied materials of the ringcaps and bushings is interesting, but most interesting is the presence of a few pieces made of casein. Either the catalin (yellow stuff) was a retrofit to broken casein mounts or they were a mix from the get go (not likely I don’t think?). 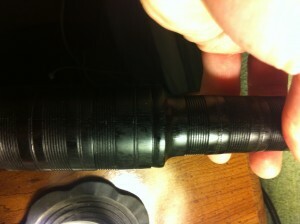 Especially since the bass bushing looks totally different. 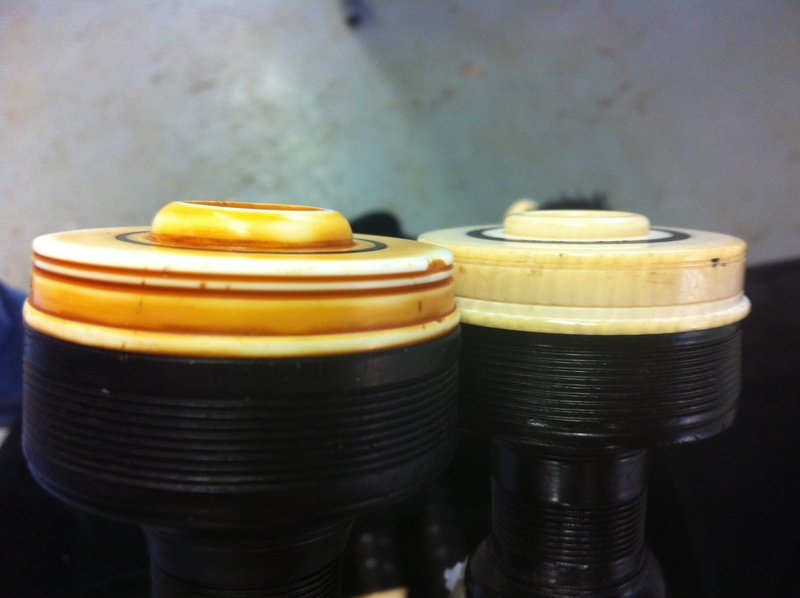 So, proof that both sets might have been originally mounted in casein. Verdict: Maybe not 1947 Robertson’s? I’m going to make up some stuff now. Not casein, yellow plastic imitation ivory coupled with a smaller bass bottom bore tells me late Robertson, maybe 1960’s? By that time Hardie is definitely using imitation ivory that will turn yellow and he’s also popularizing smaller bass bottom bores. James Robertson is also long dead so aesthetics well out the window. So turned in the Robertson shop using their long boring bits, but maybe turned by someone from another pipe maker’s firm. But, I just made that up. TOTALLY. Verdict: I think they’re 1947 Robertson’s retrofitted with catalin at some point to replace broken casein ringcaps and bushings. Lastly we have some very rough, informal audio recorded in a very live room with my new Blue Mikey Digital plugged into my iPhone 4, but trimmed and normalized in Audacity and exported as .wav so no “resolution” was lost to compression once edited. The tune is the same: first part of Deer Forest. From the recordings alone, it’s hard to give a good preference. I think I would order them, favorite first, as 1. Rocket 2. Canning 3. Kinnaird because of 1. tone 2. balance between bass and tenor. New Blue Mikey Microphone and Robertson’s!!! Robertson’s!!! I occasionally upload videos of me playing to YouTube; usually when I’m in Houston (all the ones in the green room) visiting the in-laws and don’t have my laptop with me (so no audio editing). I picked up a Blue Mikey digital which plugs into the bottom of the iPhone 4/4s and offers stereo recording with a flatter response across the frequency spectrum than what you’ll get with the built in mic (which is mono and attenuates non-speaking frequencies). Of course, every bagpipe sounds the same on YouTube (let’s hope not, there’s some pretty bad ones out there!) so this is an attempt to get decent audio in the videos I make now. I had to fiddle some more with the reed from last time and I’m not sure if I made it better or worse, it keeps going flat. Bleh…I just need to order a few more reeds from Shawn Husk and move on. So, I’m playing my Henderson’s equipped with Rocket reeds, although it’s not a solid sound because the chanter keeps moving pitch, oh well. So, the phone and my usual audio recorder were placed right next to each other so you get the mp3 and the video posted to YouTube so you can compare quality. The mp3 is recorded at 320 kbps (highest possible bitrate, I believe) and the video uses whatever codec Apple uses when recording video (something I can’t change so it really doesn’t matter!). It’s fairly uninspired playing as I was rather uninspired by the tone, but time is money and this is what I got. WARNING: Big volume difference between YouTube (quiet) and the MP3s!!! The Mikey has 3 settings: 1. quiet because you know the audio is going to be very quiet (45-65 dB range), 2. auto gain (dynamically adjust the gain), and 3. loud because you know it is going to be loud (100-135 dB range). I put it on loud since bagpipes are usually about 90-95 dB but it made the videos fairly quiet so auto gain is next. Then I ran out of space on my iPhone because I’ve got too much bagpipe music on there so the last (best?) track I only got an mp3 of off the audio recorder because it has an SD card (tsk tsk Apple). The next day I received a package in the mail form David Murry up in New York. David is a really nice guy who I correspond with regularly. He’s a tone aficionado so you can imagine we have a lot to talk about. 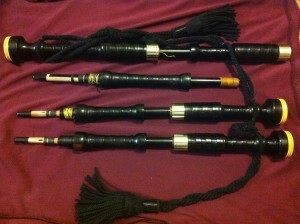 He’s recently been buying bagpipes like I buy drone reeds (meaning, a lot and don’t tell his wife). He’s got himself a set of Jeffers pipes (heard them here first, muahahaha) but he also picked a couple of Robertson’s up, an older one (1920’s?) and a newer one (1947?). He knows I have a late model Robertson fetish so he sent me the 1947s to try! Woohoo. Naturally, the first thing I did was put Canning’s in them, no brainer. Time is money and the wife was tapping her foot waiting for me to shut up so she could go to bed (the walk in closet isn’t THAT sound proof) so here’s all I got, tuning…meh. Pictures further down below. I just put the drones in my Henderson stocks so we’re missing out on any drone tone contributions from the Robertson stocks; good thing they still sound exactly like late Robertson’s with Canning drone reeds in them. If the shoe fits! So, I forgot how the first jig went (is it GDE throw or throw GDE?) so I started into the wrong tune out of the slow air (didn’t mean to play Troy’s) and so then I make sure you’re paying attention by cleverly using the last throw of Troy’s as the first throw of Kenneth’s which in the end sounds really bad, but whatcha gonna do (when they come for you?). I also boogered up the 3rd part of Donella, but who you gonna call (Ghostbusters!). Aaaaahhhhhhhhhh sigh, those were some pretty lame jokes, haha, or not. And here are some pretty pictures. 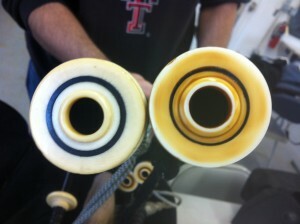 The pipes show some of the sap wood which always looks really cool. I’ve only seen it on cocuswood sets but I’m not sure what kind of wood these are. I’m fairly certain it’s cocuswood because the wood is jet black like ebony. As you can tell, David was really worried about his pipes coming to dry ole West Texas as they have the sheen of a fresh bath in oil. 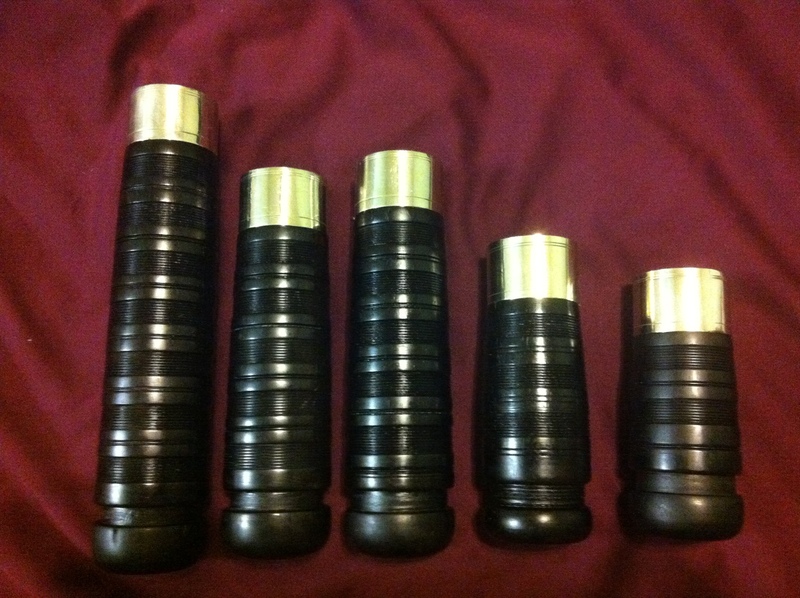 Also notice the tenor stocks are different sizes and the chanter stock seems to be a replacement, maybe? We’ve got two sets of pipes today, my Gellaitry paired with the prototype Gellaitry chanter I received a while back and then my Glencoe’s on a regular L&M bag which is a lot easier to play than the large Gannaway that was on there. First the Gellaitry’s with Gellaitry chanter! 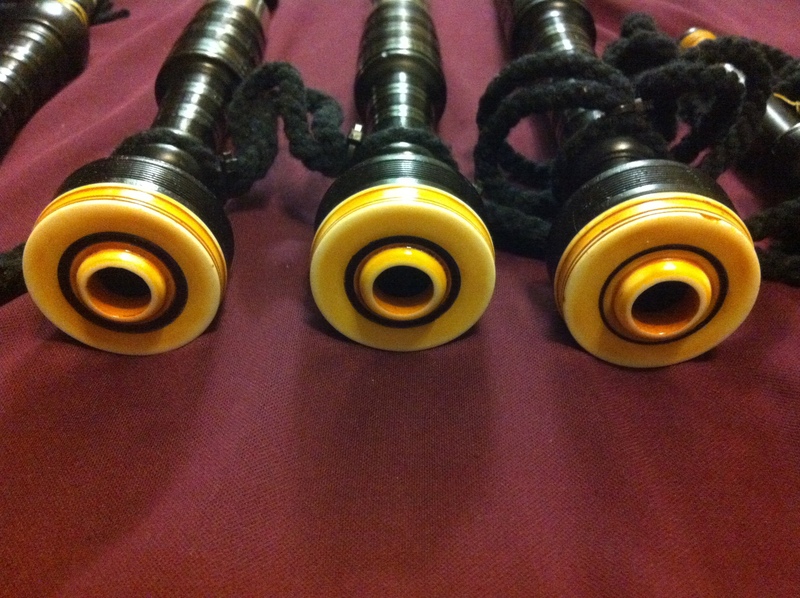 Next we’ve got the Glencoe’s going with a Selbie bass and Crozier carbon tenors. The tenor reeds are a good match for the pipe and very reliable, but Selbie would offer a bit more in the overtone department which I think makes this set sound spectacular. Another note is the chanter reed is a little odd. In order to quickly bring the reed (Gilmour) closer to my playing strength, I pinched the staple a wee bit and shaved a bit of cane off. However, I believe I’ve pinched it just a wee bit too much. Highly indicative of this is the instability of low A. Oddly enough, if you blow harder on low A it gets flatter, rather than sharper. 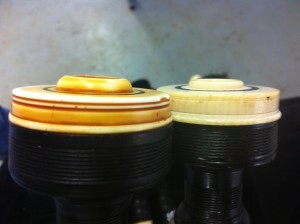 This is indicative of the reed closing down due to being over blown. It’s also opposite from what the high A does, which gets sharper when blown harder. Additionally, I’ve got a fair bit of tape on high A and G, so out with the poker thing I can’t remember the name of to open the staple back up a little bit. Pinching the staple right where the binding ends is usually my first resort to easing a reed because they dry out in West Texas and really open up. This leads to very flat C’s and F’s and just pinching the reed (with a set of pliers, usually) eases the reed and brings the pitch of the C and F up. 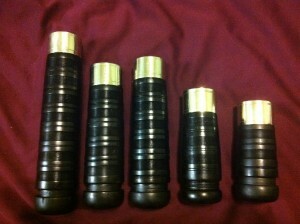 So, a little instability in the chanter but here they are anyway. Marches! We’re listening to a blackwood Colin Kyo chanter in these two.